Bruce Arians was born October 3, 1952 in Paterson and grew up in York, Pennsylvania. He attended York Catholic High and starred for the Fighting Irish football team at quarterback. He attended William Penn High School, also in York, before accepting a scholarship from Virginia Tech. Bruce spent his first three seasons with the Hokies as a backup quarterback—two of those years behind Don Strock. Bruce earned the starting role as a senior in 1974 under coach Jimmy Sharpe. Virginia Tech won just four games. He threw for 3 touchdowns and ran for another 8 out of the team’s wishbone offense. The following season, Bruce accepted a job as a graduate assistant and over the next 8 years worked as an assistant at Mississippi State and Alabama, working under Bear Bryant as the running backs coach. Bruce got his first head coaching job at Temple in 1988. He led the Owls for six seasons and went 27–48. Among the future NFL starters he developed were defensive backs Kevin Ross and Todd Bowles. In 1989, Bruce was hired by Kansas City Chiefs coach Marty Schottenheimer, to work with the team’s running backs. On the same staff were Tony Dungy and Bill Cowher. During the 1990s, Bruce returned to the college ranks, where he served as an offensive coordinator for Mississippi State and Alabama. In 1998, the Indianapolis Colts hired Bruce as the quarterbacks coach. He developed a close working relationship rookie Peyton Manning, who quickly developed into a star. In 2001, Bruce went to work as offensive coordinator for the Browns under Butch Davis. One of the team’s defensive coaches was Chuck Pagano. In 2004, Cowher—now the coach of the Steelers—hired Bruce to work with Ben Roethlisberger. In 2007, he became the team’s offensive coordinator, a position he held through the 2011 season. Pittsburgh won two Super Bowls during his time with the club. Following the 2011 season, coach Mike Tomlin felt he had become too close with Roethlisberger and decided to fire him. Bruce was ready to leave pro football when he received a call from Pagano, the new coach of the Indianapolis Colts. The Colts planned to draft Andrew Luck and Pagano was looking for someone to nurture the young star. However, early in 2012, Pagano had to step down after being diagnosed with leukemia. Bruce was named interim coach and led the team to nine more wins and the team finished finish 11–5. He was named NFL Coach of the Year—the first time that honor had been bestowed upon an interim coach. Ironically, after Pagano returned to lead the club into the playoffs, Bruce missed the Colts Wild Card loss to the Ravens when he was hospitalized by an acute inner ear infection. A few weeks later, the Arizona Cardinals hired Bruce as their head coach. He led the team to 10 wins in 2013. It was the best season by a first-year coach for the Cardinals in almost 90 years. In 2014, Bruce stepped into the ranks of elite NFL coaches when, despite a series of catastrophic injuries to his starting QBs, he kept his team in a neck-and-neck battle for the division lead with the Super Bowl champion Seahawks and guided Arizona to a playoff berth. Bruce coached the Cards to a 13–3 mark in 2015, and got them all the way to the NFC title game. Unfortunately, they lost to the powerhouse Panthers. The 13 victories established a new franchise high. The team took a step backwards in 2016, however, finishing 7–8–1 and out of the playoffs. 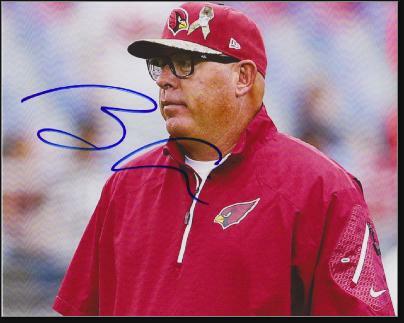 The Cardinals went 8–8 in 2017, after which Bruce announced that he was leaving coaching to work as a braodcaster. During his first year away from coaching, Bruce got the itch. When the Tampa Bay Buccaneers offered him their vacant job he decided to get back in. His first hire was his old defensive coordinator Bowles, who had just been shown the door by the New York Jets.